Cabinet photograph of a dapper young man identified on reverse as Frank Wyant. 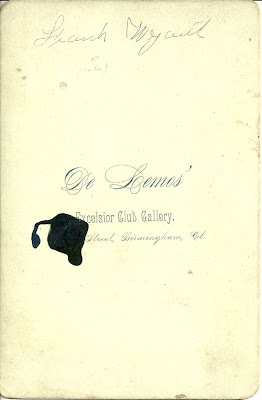 The photograph was taken by De Lemos' Excelsior Club Gallery, Birmingham, Connecticut. Frank reminds me of one of my favorite actors, Jean Rochefort. 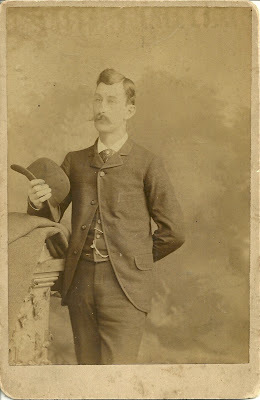 Frank Wyant was born in May of 1853 [I found another date online] in Connecticut, the son of George Sydney Wyant, who died in the Civil War in 1862, and his wife Mary Catherine (Rowe) Wyant. Mary Catherine's father also came to an untimely end, when he drowned in Lake St. Clair in 1830 on his way home to Connecticut to get his family after finding a place for them in the Detroit area. At least they weren't on the boat with him when it sank. George had an older brother, Wilson, who was a captain in the Civil War, but resigned in January 1863. Where George had died just the previous month, I'm wondering if Wilson felt he had to return home to take care of his own and his brother's families. Frank married Julia Ladd on 21 September 1886; they had a son Leroy Abraham Wyant, born in 1890. Julia died in 1890, perhaps in childbirth. In 1891, Frank married Mary Faber, and they had a son Leslie Frederick Wyant. Frank H. Wyant was still alive as of the enumeration of the 1920 Census. He may have died before 1930, as Mary (Faber) Wyant listed herself as head of the household in the 1930 Census. If you have any corrections, additions or insights regarding the above information, please leave a comment in the comment box below or contact me directly.